I’ve been into photography as a kid and the natural progression was to migrate to digital photography. Many moons ago when I first started processing images on my computer, I bought a scanner and with that came a free SE version of a program called PhotoImpact from Ulead. It was so good that I bought the full package – indeed I went through just about every version of it until recently – getting more and more disillusioned with ULEAD’s attitude – minor improvements every expensive upgrade, no freebies or regular fixes. Eventually I scrapped it in favour of the much more expensive Photoshop and even that has now gone by the by as I’ve now adopted the free GIMP (Windows version) and am very happy with it. It’s not quite as good as Photoshop but then I’m not supporting Macromedia’s greedy pockets – and they ARE greedy pockets – just check out the cost of Dreamweaver. For some years it’s been part of my job to handle the odd video creation, one example being the FSB’s conference in which for the last 3 years, live editing has been required – in a hectic environment with not a lot of time to spare. Ulead MediaStudioPro was in it’s time a very viable option for this and other editing chores, being cheaper than some of the other pro offerings and even a little faster than the market leader – but for ages, lack of support has been a problem and the fact that the package won’t run in Vista (not that I’ve any intention of using Vista – but I will be using Windows 7) and it recently came to light when helping a member of staff with a combined slideshow+music+voiceover that MediaStudio Pro doesn’t always sync sound too well. Indeed I had to buy a separate sound package to get things right. Bearing in mind this is a professional video package and not cheap.. I decided it was time to look for alternatives and started downloading boatloads of demos. To cut a long story short I stumbled on something called MAGIX (I know, I know, STUPID NAME) and downloaded the demo while on holiday in Spain. To say I was impressed would be an understatement. Fast, accurate, easy to use but REALLY powerful. Another issue I had with MediaStudio was getting the right “anamorphic” setup for widescreen video – BLIP.TV (a streaming media service a bit like YouTube) seemed to have an issue and we spent ages messing with settings in MediaStudioPro. No more… – along comes MAGIX – works out of the box no problem and I’ve tried various experimental quality settings all work perfectly when the file is uploaded to a streaming service like BLIP. Unbelievable – so cheap I just went ahead and bought it! Ok, so for £34 it has to be rubbish, right? Even the retail at £64 makes this a toy? Anyway I’m not a salesman – here’s a PDF with more info. If you’re into making short movie clips and need something fast, easy to use and cheap – well, I’ve not found anything better. Those of you who read my constant gripes about mobile phones will know that I’ve stuck with HTC for the longest time. There can be no doubt that their phones are pretty. 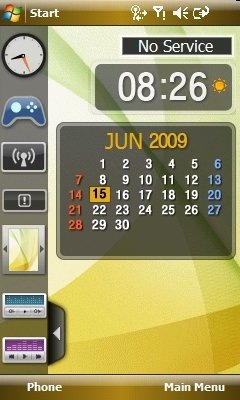 For some time now I’ve been using the HTC Touch Diamond while Maureen has been using the Diamond HD. By last week I was onto my 4th Diamond phone due to a repeating issue with the ringer doing dead. Looking around the forums it’s pretty clear that no-one has a clue what this is – and it happens to lots of people though not the majority (or at least they don’t report it). The phone will work for so long and then simply stop ringing when someone calls. Everything else works… general sound works, testing the ringer works – but incoming calls produce… silence. The only way out is a reset – and the problem with that is – to make the phone work you’d have to reset every day.. as you can’t predict when the problem will occur. I finally lost it with Orange last week and demanded another phone. The first person I spoke to was useless – I made the mistake of thinking that Samsung phones (she offered me 2 models) were not smartphones – thankfully on my next call a very well spoken gent put me right – and introduced me to the Samsung i900 Omnia. I’d originally asked for an upgrade to the Diamond HD (the larger brother of the Diamond – which bears more than a passing resemblance to the iPhone and works a treat) – but as is the way of things in the mobile industry – it’s now defunct. WHY they do this with phones that work, while keeping phones that DON’T work is beyond me. Anyway – the HTC Touch has another fatal flaw – it comes with 4Gig of memory built in and no expansion. Once you get TomTom in there and maybe a movie – that’s it – you’re done. What sold me on the Samsung was when the Orange operator pointed out that the i900 comes with 16Gig AS STANDARD – AND has expansion, so in total you could have 32gig of memory – enough for all your photos, all your tunes and a good number of movies and apps – AT LAST, a serious mobile. So I decided to show you the phone and the first thing I had a problem with – the original Microsoft screen-grabber no longer works… until I found MyMobileR – it’s free and it works. And so here is the Samsung i900… complete with screenshots (most of the software is built-in – the rest are free or cheap apps. The phone comes complete with the usual – Windows Mobile 6 and a host of Microsoft utilities including a fairly useless OneNote – by name only. HOWEVER check out Evernote which lets you take audio, text or scribble notes and sync them with your PC – and does it well. Of course that would not be much use if it were not for high speed cell communication, WIFI and Bluetooth – and the i900 has the lot along with GPS and more! It even has an FM radio. Google Mobile Apps gives you your messenger and email, Skype – well – works! The RSS reader lets you keep up with your news, you can FTP to your PC via Bluetooth…. the list goes on – I suggest taking a look at this phone. It comes with mains charger and the ONLY gotcha is the crappy connector which means you can’t use all your mini-usb chargers – however I’ve just sent off to China – for around £8 I have a car charger, silicon case, screen cover and spare battery on the way – I’ll let you know how they pan out! Now, to be fair the GPS has issues, it does NOT like TomTom but there is a program for a few dollars in the states – which takes the GPS further than you might imagine. For a mere $14 or thereabouts not only does it fix the GPS on the i900 but also lets you share it by a number of ways with other programs – simultaneously – you can even share the GPS with your PC via Bluetooth – stick MapPoint on your PC – turn the Bluetooth serial port on and Bob’s your uncle. It even lets you SIMULATE GPS when you’re working indoors to test things. WELL worth the money. The program is called GPSGATE. Of course there is a lot more to the use of this phone than this – OH – before I forget – typical touch-screen Smartphone (pocket PC) the buttons for the telephone and keypad are no real – i.e. 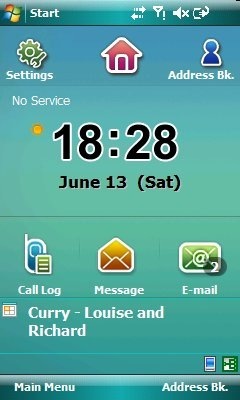 they are onscreen – but where the i900 scores is it uses vibration feedback to give you a sense of having hit a button! 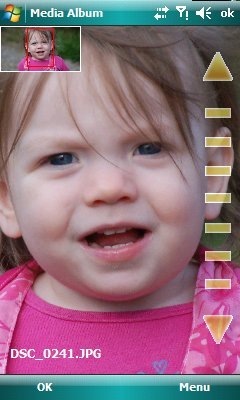 Did I mention the phone has accelerometers? So it knows which direction it is facing and can go into landscape or portrait mode automatically (I turned that off – speeds things up a lot). As for images – 1.5 meg original JPG images played a treat. They really do seem to have cracked this – in a phone that’s small, light and thin with a half-decent (only-half) camera and a “flash” – though in reality it’s a bright white LED so don’t get too excited by the possibilities. See the pic of my grand-daughter on the right. Opera browser and the new Skyfire browser all work – though I don’t think the WIFI is as sensitive as the HTC. 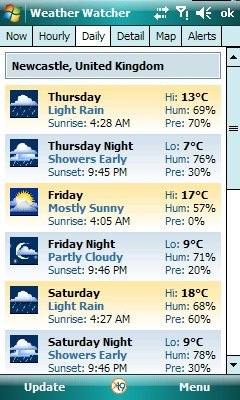 The phone does not come with weather software but a quick look on the web for a freeby sorted that out. Weather Watcher works a treat. The camera is a 5Mpixel effort with built in ability to take panoramas using up to 8 original images – all automatically – you just take the first shot and move the camera until it takes the rest. 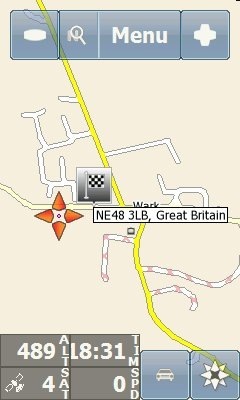 Mapfactor Navigator turned up today – and I have to say – I think it blows TomTom out of the water. For £69 you get full maps of all of Europe plus of course the UK – now, I’m only really interested right now in the UK and Spain – and you can select what you install – result – the entire installation – which works in storage card space of course, takes up well under half a gigabyte – which, given the Omnia’s expansive 16Gig – is hardly a drop in the ocean! I don’t have time to go into the details of Navigator here but the key things are 3d navigation, voice-guide, you get a PC program to update maps, put waypoints in etc etc, it has so much programmability it will keep you going for hours, most of the little windows can be selected by simply touching them and then selecting from a larger range… which is great as some folk want to know what speed they are doing, others want to know the height from sea-level – and that’s on of my gripes about Tom-Tom, it doesn’t give you that level of flexibility. The program comes complete on a DVD with maps, points of interest and cameras and features FULL postcodes!! Up to now I just can’t fault it – best buy I’ve had this year! It also comes with an odometer feature and for a little extra it can handle vehicle tracking… though GPSGate can easily handle that also. 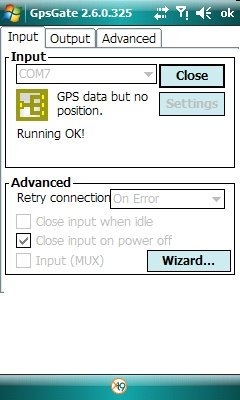 Unlike Tomtom this software does not require the likes of GPSGate when running on the i900 Omnia – it works out of the box. Finally if you have the right hardware it can handle TMC traffic monitoring – that’s my next job – for now I’m enjoying up to date maps and hassle-free sat-nav! Oh – if you are into Twitter, get pocketTwit…. absolutely marvelous. 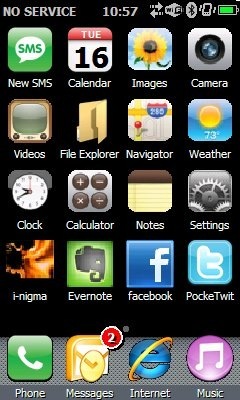 I added that and the new pocket mobile Facebook app. This time around I’m running Navigator natively, i.e. 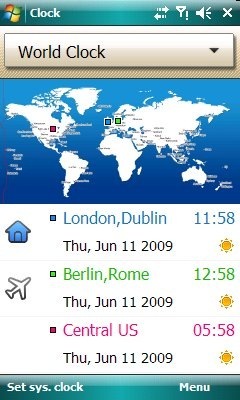 without GPSGATE – as there is no point in having TomTom using up space. 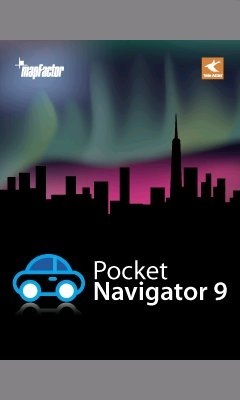 I have however purchased GPSGATE as it’s useful for sharing the phone’s GPS with my laptop! If you read my previous blog on video, you’ll have seen the issues I had putting together a Powerpoint with audio. Ultimately I ended up using MediaStudio Pro (no longer supported as Ulead are terrible at support – another company that appear to have lost their way) and a dedicated sound package. 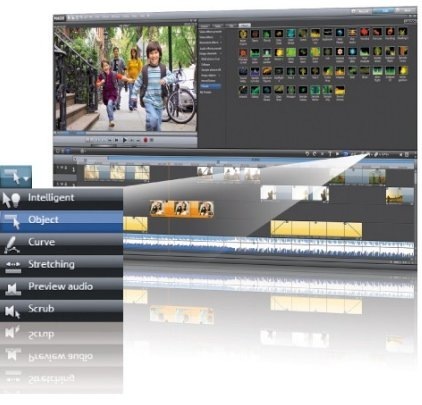 Well, life goes on – check out MAGICX Movie Edit Pro 15 Plus. Does the lot – video, slides, voice+music – sound envelope control – you name it. My next project will use this and at the time I’ll provide screenshots.